One of the world’s most eminent architects who has a unique association with Sri Lanka visited the country to grace the 35th annual sessions of the Sri Lanka Institute of Architects (SLIA). 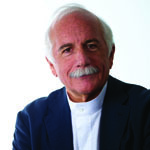 Moshe Safdie – the man who designed Altair, the country’s most distinctive and instantly recognised high-rise – was one of seven speakers on the topic of ‘Return of the City: Megastructure Redefined’ at the BMICH on Wednesday, 15 February. While in Colombo, Safdie was expected to visit the site of Altair, now at its 48th level on the vertical tower and the 43rd on the sloping tower, and meet representatives of its promoter, Indocean Developers.